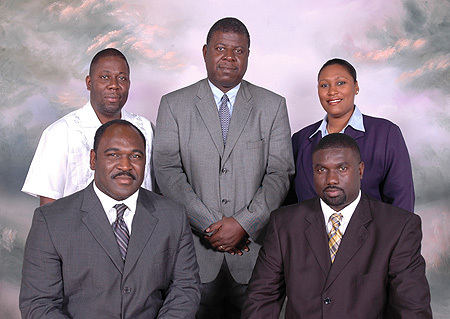 The Bahamas chess community announced their board for the 2006-2007 year. Kean Smith will replace Thierry LeBoeuf as President and will seek to lead the Bahamas to new heights. Seated from left to right: Kean Alfred Smith, President and Phillip Paul, Vice-President. Standing from left to right: Hiram Victor, Treasurer, Milton Evans - Council Member and Karen Butler - Secretary. On Saturday 10th December, 2005 the Bahamas Chess Federation held its Prison Yuletide Classic sponsored by Holiday Ice Ltd. Sixteen (16) players, seven from the Chess Federation and nine prison inmates faced off in this 4-round Swiss Tournament with a time control of 15 minutes. The current Bahamas Junior Champion, Elton Joseph, won the tournament finishing with four points. There was a four way tie for second place between, Byron Small, Joseph Ferguson, Lavado Thompson and an inmate. Kean A. Smith finished third with 2½ points. The inmate who finished in the top five is one of 28 players forming two groups of 14 that meet twice per week on the Prison Compound for weekly chess play and classes under the supervision of Mr. Warren Seymour, Bahamas Chess Federation Tournament Director. The Prison Chess Program initially started in the 1970's and recommenced in the 1990's after a break.